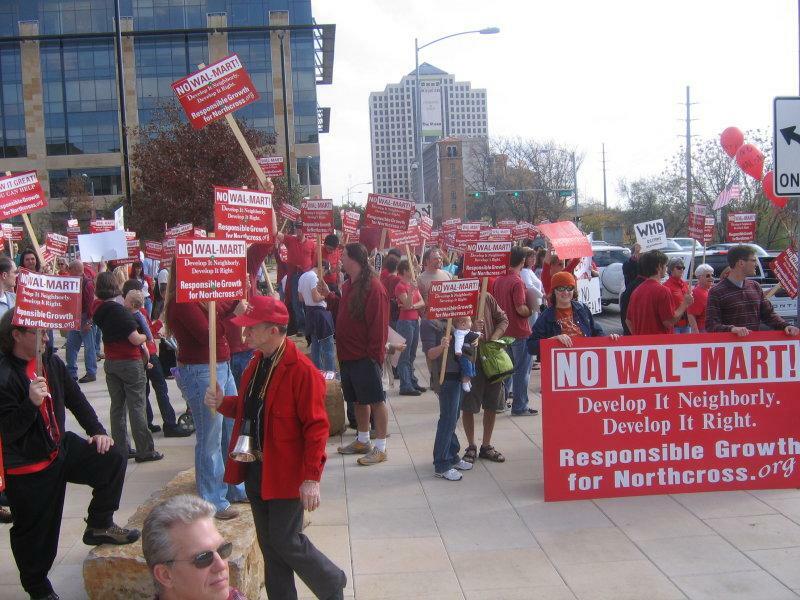 A public protest at City Hall and a well orchestrated series of testimony before the City Council by Responsible Growth for Northcross did not persuade the City Council to vote to stop Wal-Mart. Points brought up by the group regarding improper notification, an inaccurate Traffic Impact Analysis, and need for a conditional use permit for the proposed garden center were countered by City staff. Council members McCraken and Kim asked many questions and were clear about their concern with the development but when time was up no vote was taken. For more on last night’s hearing, read today’s Statesman, "Austin OKs new rules on big stores," or go to KVUE’s web site: "City Council hears Wal-Mart debate at meeting". ANA’s Executive Committee is meeting to discuss the project on Saturday at 11:00 at Yarborough library. Please submit the issues you want addressed regarding this development in the comment section below. It is a fact that Lincoln Property Company has made deliberate attempts to mislead the residents of Allandale, city staff, and the members of the Austin City Council. Unless a new and different site plan is submitted by Lincoln Property Company, then there is very little to discuss. A question that was asked that I have yet to see an answer for, is what is meant by the transportation review having been REJECTED? How was the site plan approved despite this rejection? Considering traffic issues were discussed in detail and are going to be researched further, this point is probably moot, but I’m still curious how the site plan could be approved with this item on there. I would like to request that traffic impact on the Burnet/Ohlen/Steck intersection specifically be looked at. While I don’t have much to base this on, I suspect that a lot of business to a Northcross Wal-Mart will come from Wooten and the area around the Target at Ohlen and 183. Regarding the garden center, at last night’s meeting, there was discussion about whether it should be considered an accessory use. The size of the garden center was mentioned to be something over 4000 square feet, which is larger than the size of the small businesses mentioned at the same meeting. If the very same are could be denied because it constitutes a primary use if it is a stand-alone unit but considered an accessory use just because it’s attached to a monstrosity that dwarfs it, I think there is a serious problem. That means Wal-Mart can open up a garden center an Mom/Pop cannot, even if it is the exact same garden center. That is not equitable. I’d further like to know WHY garden centers have conditional use status. Could it be related to environmental considerations? If so, I think people should take a good look at catawbariverkeeper.org and look at the information there explaining how Wal-Mart ignored repeated and escalating complaints about garden center related runoff to the Catawba River. I think that it’s also perhaps relevant that the garden center is located on the side of the property closest to Shoal Creek. From my understandig, the LCRA furthermore has no jurisdiction in this matter. Who does? Surely someone does! It seems to me that would be the city. Sloughing the garden center off as a mere accessory just because it is dwarfed by the rest of the project is shirking responsibility for water quality in Shoal Creek. I’m a homeowner in Allandale, on Albata. Though I am not an attorney, it seems clear that the membership of the Real Estate Council of Austin is acting collectively in a deliberate manner which will likely cause our neighborhoods’ property values to fall. At what point do we seek legal remediation against RECA, in terms of a class action lawsuit against the organization and its members? Also, our set of neighborhoods affected by the City Council’s inaction represents a large number of votes. At what point do we initiate a recall election against elected officials in Austin who have been siding with Lincoln Properties and WMT? Would it be feasible to pursue a class action lawsuit for damages against the shareholders of WMT? If we have real measurable damages, then the aggregate amount of damages in these neighborhoods could easily get into 8 or 9 figures. We should have some means for legal recourse to recover damages. Another datapoint we could followup on. One of the ways this disagreement can be viewed is ‘neighborhood versus big_box’. What does this situation look like when it’s ‘big_box versus big_box’? I think we can learn something from Home Depot versus Lowes in Cedar Park. From what I understand, Home Depot was given free reign to plop down in Cedar Park long ago and more recently Lowes planned to open up not too far from them. Home Depot unofficially and covertly launched a campaign to block the Lowes completely, if not delay and cause more expense. By attacking the new Lowes development on the basis of power and environmental regulations, they forced Lowes to go back to the drawing board repeatedly. I take two things away from this. 1) They ended up with a building that met the regulations with things like huge numbers of sky lights. 2) Lowes still got thier building. After the performance of City Council tonight, I don’t have much hope they will lay down the gauntlet against the largest retail company on Earth. The council is likely to walk the fence like good polititians. Much like Lowes, Wal-Mart may be inevitable at this point, seeing as they have cart blanc on zoning set in 1969. Likewise, I don’t see Lincoln backing down either for fear of litigation, I am sure a company like Wal-Mart has their legal ducks in a row, or for the easy money. I would like to know if we’d consider asking that Foster be permanently blocked off somehow (maybe by closing the entrance/exit on the W side of the mall area) to prevent traffic from coming and parking in the neighborhood. To me it looked like there isn’t enough parking on the site plan (despite the 3 story garage). How much parking will be going on in our hood? So my concerns are about traffic and parking on Foster, and also Great Northern. Maybe we could also consider adding more speedbumps around the area, like those on Greenlawn. A friend of mine who lives on Jefferson said that they are working great to cut off traffic around his house! Also, we need MoPac & Anderson included in the traffic study. Everyone in town headed north is going to “stop off at WalMart for a few things” nn the way home each day. 1.I would like to request that ALL discussions or “negotiations” with Richard Suttle, Wal-Mart, Lincoln Property Company, or any representatives of these individuals or organizations be done in writing. 2.I also request that the language in all correspondence be approved by a vote of the ANA Executive Committee. If this is the appropriate forum, I would like to hear reclarification of ANA’s stance and role in the Northcross Development apecific to the results of the online survey, which I can no longer find. I thought that almost 70% responded – “No Wal-Mart”. While the “Allandale Neighborhood Association requested the City Council to instruct City Staff to suspend the permit and site plan” ANA Executives did not seem to have a formal role at Thursday’s meeting. Additionally, what objective guidance is the ANA Executive Committee using to “protect the quality of life, safety, residential characteristics, and property values” of Allandale and is there a mechanism in place to measure these results. It is my understanding that at the last meeting, the Allandale Neighborhood Association voted to request that City Council suspend site plan approval for the Wal-Mart, indicating that the majority oppose the current plan for Northcross. But there is nothing about this on the website or in any of the RG4N materials. Why are we not on the record on this? Why do posted comments that don’t fall into line with the RG4N’s political agenda seem to disappear from this site? I’m an Allandale homeowner and I don’t want Wal-Mart in our neighborhood. The Wal-Mart representative told me that they will NOT compromise on the store size OR the hours. This is completely unacceptable. So much for democracy…The ANA needs to take a strong stand for our neighborhood and against big boxes destroying it. Why haven’t they? Is there a little conflict of interest here?